Top Rank, The Parade, Watford. Circa 1960s. I lived in Croxley Green and then Rickmansworth Road in Watford from the age of 5 (then 1957) until 28, when I moved away to Basingstoke. I went to Durrants School, and then on to Harrow School of Art. I had many wonderful school friends, some of whom I still see regularly, and I often think back to those days of Beatles, Biba and beautiful Watford. It’s only now that I am reading other stories from my youth that I realise how lucky I was to grow up in such a great town. My memories are of playing tennis in Cassiobury Park, and walking through Gade Avenue to get there, passed the river. I also worked at my first part-time job in Fine Fare supermarket just after it opened. I remember getting £4 for working Friday evenings and all day Saturday. The money I earned was used to buy fabric from Watford Market to make a mini skirt on two hours flat! Top Rank was such a luxurious treat on a Saturday morning – it seemed that America had arrived in our little town. Diana Rigg was my heroine and gave me the idea that a woman could do more than just survive in a mans world – it was a time of change for women. I also worked in Cawdells on Saturdays (for the terrifying Mrs Thornton) and discovered make-up and womens underwear for the more mature woman! I remember dusting endless shelves, only to be told to dust them again, rather than stand and do nothing. Cawdells had a black wrought iron lift on the right of the ground floor, but I can’t remember if it was manned or not. I can also still remember the rich flavour of the Lyons ice creams that were sold to you in a sort of cylinder with paper which you used to remove yourself – this came with matching double barrelled cornets, one for each ice cream. Was it Woolworths? I also worked for a time in Hinds Jewellers in Clements and spent all my hard earned cash on rings, (still do!) I think my parents Bob and Joyce Foster were extremely happy living in Watford, but mourned the day that the dreadful flyover was agreed and built. Something died in Watford after that, which is why its so nice to read about the days when it was in its original form. Reading these stories has made me smile. Thank you. This page was added on 09/06/2014. Wonderful Watford is my home town and I was born in Watford Maternity hospital, Lady’s Close. Toni bell further down the high street! Geoff Woolfe – are you the same Geoffrey Woolfe who sat next to me in Miss Bull’s class at Knutsford? 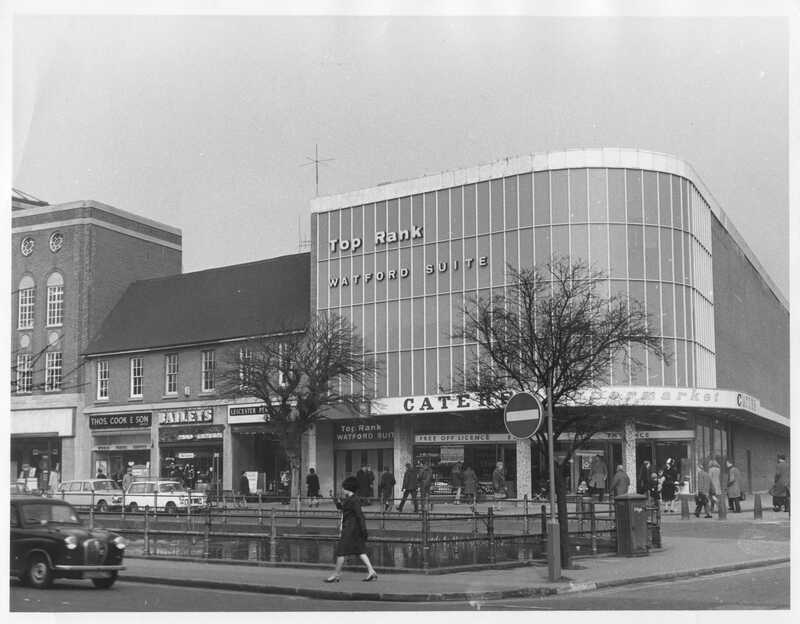 Back in the 60s I remember the mocha bar next ro Baileys…..then we discovered the sadly demolished Dog pub next to the college… anyone rbemember chef corner ? I left the town in 1968 27 years after I was born at King St maternity hospital…..
Watford has been my town for 8 years, after leaving The States, and I love hearing about it’s history and past.